34 MMS November 2017 mmsonline.com RAPID TRAVERSE Machining Technology in Brief rates, which is the maximum speed at which the probe can scan, depending on machine capa- bilities and required tolerances, the system can provide as many as 1,000 data points per second. It is designed for applications in which free-form calculations are not required. The Sprint version with Productivity+ probe software, which is capable of scanning speeds ranging to 15 m/min., is said to be well-suited for advanced applications such as automated aircraft engine manufacturing with real-time access to true-machine-position data during measurement operations. Both the Sprint with Supascan system and Sprint with Productivity+ also use the com- pany's OSP60 optical scanning probe. 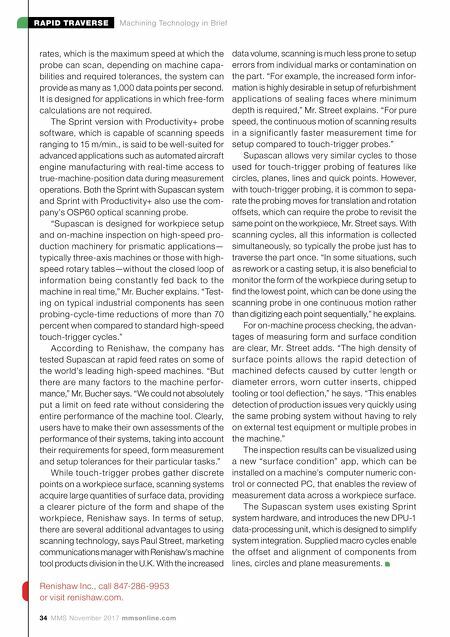 "Supascan is designed for workpiece setup and on-machine inspection on high-speed pro- duction machinery for prismatic applications— typically three-axis machines or those with high- speed rotary tables—without the closed loop of information being constantly fed back to the machine in real time," Mr. Bucher explains. "Test- ing on typical industrial components has seen probing-cycle-time reductions of more than 70 percent when compared to standard high-speed touch-trigger cycles." According to Renishaw, the company has tested Supascan at rapid feed rates on some of the world's leading high-speed machines. "But there are many factors to the machine per for- mance," Mr. Bucher says. 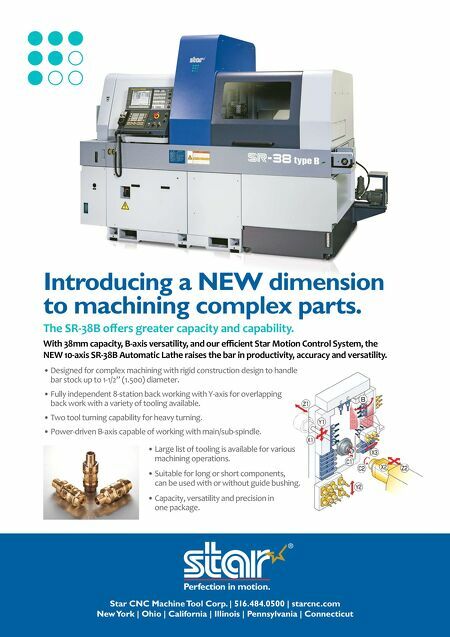 "We could not absolutely put a limit on feed rate without considering the entire performance of the machine tool. Clearly, users have to make their own assessments of the performance of their systems, taking into account their requirements for speed, form measurement and setup tolerances for their particular tasks." While touch-trigger probes gather discrete points on a workpiece surface, scanning systems acquire large quantities of surface data, providing a clearer picture of the form and shape of the workpiece, Renishaw says. In terms of setup, there are several additional advantages to using scanning technology, says Paul Street, marketing communications manager with Renishaw's machine tool products division in the U.K. With the increased data volume, scanning is much less prone to setup errors from individual marks or contamination on the part. "For example, the increased form infor- mation is highly desirable in setup of refurbishment applications of sealing faces where minimum depth is required," Mr. Street explains. "For pure speed, the continuous motion of scanning results in a significantly faster measurement time for setup compared to touch-trigger probes." Supascan allows very similar cycles to those used for touch-trigger probing of features like circles, planes, lines and quick points. However, with touch-trigger probing, it is common to sepa- rate the probing moves for translation and rotation offsets, which can require the probe to revisit the same point on the workpiece, Mr. Street says. With scanning cycles, all this information is collected simultaneously, so typically the probe just has to traverse the part once. "In some situations, such as rework or a casting setup, it is also beneficial to monitor the form of the workpiece during setup to find the lowest point, which can be done using the scanning probe in one continuous motion rather than digitizing each point sequentially," he explains. For on-machine process checking, the advan- tages of measuring form and surface condition are clear, Mr. Street adds. "The high density of sur face points allows the rapid dete ction of machined defects caused by cutter length or diameter errors, worn cutter inser ts, chipped tooling or tool deflection," he says. "This enables detection of production issues very quickly using the same probing system without having to rely on external test equipment or multiple probes in the machine." The inspection results can be visualized using a new "sur face condition" app, which can be installed on a machine's computer numeric con- trol or connected PC, that enables the review of measurement data across a workpiece surface. The Supascan system uses existing Sprint system hardware, and introduces the new DPU-1 data-processing unit, which is designed to simplify system integration. Supplied macro cycles enable the of fset and alignment of components from lines, circles and plane measurements. Renishaw Inc., call 847-286-9953 or visit renishaw.com.